Once again I decided not to go with any theme for my marathon this weekend... just watching whatever I am in the mood for at the time. A small group of survivors in a post-apocalyptic world take refuge in an empty hospital with plans on rebuilding society. They rescue a young girl who is the victim of a brutal attack, but soon discover that they were followed by a savage band of cannibals known as Rovers. The Rovers begin to kill them one by one, and the trapped survivors must find a way to outwit their stalkers. This is a movie I originally bought for my October Horror Marathon... but never got around to watching. These After Dark Horrorfest releases are a bit on the hit or miss side... but out of 15 releases that I own... I had a hard time sitting through only one of them. In the case of this movie. It isn't a bad movie... but it really could have been much better. The twist of the movie was really obvious. So obvious in fact that I had the twist figured out the moment I seen the character it involved. That alone brought my score of this movie down. This is the second After Dark Horrorfest release of this past year that has Rider Strong in it. If you recognize the name but just can't place who it is... he played Shawn (Corey's friend) on the '90s sitcom Boy Meets World. In Los Angeles, the criminals are one step away from taking over the city. Drugs and guns are all over the streets. It'll take a special kind of cop to put an end to it all. 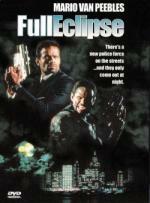 Max Dire (Mario Van Peebles) is a special kind of cop, which is why he's invited to join an elite squad - a secret police unit - authorized to do whatever it takes to put an end to crime. Their leader, Adam Garou (Bruce Payne) has a secret method for dealing with crooks, a serum which when injected into his gang of rogue cops, gives them an extraordinary strength and speed. A drug that gives them the power of wolves, and a deadly appetite for crime. Max is suspicious of Garou's renegade police force, but is soon seduced into joining them by their most beautiful member, Casey Spencer (Patsy Kensit). As Max soon discovers, there's a dark side to Garou's detective work and he must decide if he's going to run with the pack or stand against them. Either way, by the full eclipse, the streets will run with blood. This is a movie that originally aired on HBO... even though it is far from a great movie I always enjoyed it and was happy when I found it was on DVD. This really is a different kind of werewolf movie... as the cops get their "werewolf powers" from a serum. I also enjoyed the reveal of what the "serum" is... even though I found it to be pretty obvious. This is the first time I have watched this movie since I first got 5 years ago. So it was really like watching it for the first time again. It is a fun movie... I enjoyed it. I can see why my daughter enjoys these movies so much. Even though this is a rather long movie you don't realize it while watching it as the time flies without you even realizing it. The UK title of both book and film is "Philosopher's Stone", not "Sorcerer's". This is because Americans by and large don't know what a Philosopher is and even if they did, they wouldn't be able to spell it. Or say it. 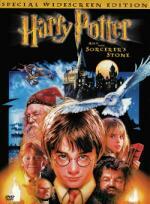 The book was retitled to Harry Potter and the Sorcerer's Stone for publication in the United States. The main reason for this retitle was that the U.S. publishers thought that a child would not want to read a book that sounded as though it was associated with philosophy. Arthur Levine, my American editor, and I decided that words should be altered only where we felt they would be incomprehensible, even in context, to an American reader... The title change was Arthur's idea initially, because he felt that the British title gave a misleading idea of the subject matter. In England, we discussed several alternative titles and Sorcerer's Stone was my idea. Backwoods hicks mistake barrels of toxic waste for moonshine and become tobacco-chewin', gut-stompin', cannibal kinfolk from hell!! 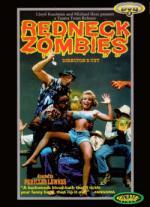 The goriest laugh-riot ever produced.Redneck Zombies is an unforgettable onslaught of dismemberment and human body parts. Now restored to it's glory in an exclusive director's cut! Ok seeing the above I am sure the first thing coming to your mind is why in the hell would I even attempt to watch such garbage. There is no way in the world there could be anything good about this movie. And if it was any movie of equal quality I would definitely agree with you. But in this particular case it is not about the movie at all. This movie was made just down the street from where I live. And even as God-Awful as this movie is... it holds a special place in my heart. First of all because it is fun seeing all the familiar areas. But then there is the fact that Alice Stanely is in this movie. I know... I hear you all saying WHO?!?!?! She is a local woman that used to cut my hair. This is the only thing she did... and she only did it for fun. But for me... it is a lot of fun seeing the woman that used to cut my hair get decapitated. Ok... so maybe now you know why I enjoy popping this movie in every few years or so. Now... for the movie itself... As I said before... this is a God-Awful movie. Acting is absolutely terrible... to the point of laughable. The story is ridiculous.... and the effects (which is probably the best thing about the movie itself) is pretty much idiotic. There is no way I would ever recommend this movie to someone else. If I had a haircut like yours, I'd want to see my hairdresser decapitated too!